As the author of this blog, a monthly USA TODAY column and various features about how to make the most of your time stuck at just about any airport, I’m often asked which airport is my favorite. But when pressed, I admit there are a few airports I’ll actually build a trip around. Oregon’s Portland International Airport is one of them. 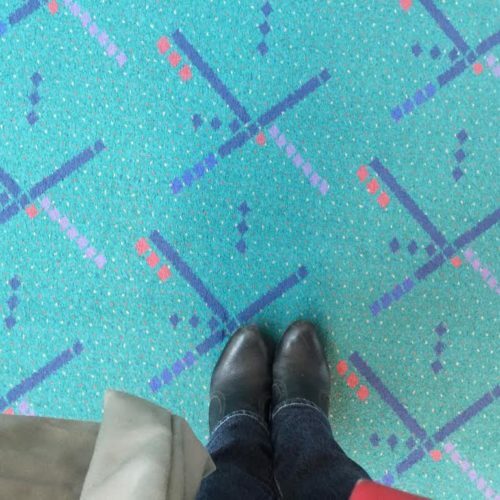 Its perks are plentiful and, like the city, PDX airport is super environmentally-conscious and kind of quirky. For example, an assembly/repair station and a tool check-out where cyclists can borrow a pedal wrench or air pump encourage biking to the airport. And the recently-replaced but hipster-embraced terminal carpet lives on in everything from coasters and caps to dog leashes and luggage tags made from remnants of the old rug. Shopping for these and other unique-to-the-region items at PDX is a pleasure, in part because Oregon has no sales tax and the more than 60 stores and restaurants must offer their goods and services at prices no higher than what would be charged at off-airport locations. And there are plenty of Oregon-based venues where you’ll want to spend your money, including the pre-security branches of Oregon-based Pendleton, Nike, Columbia Sportswear and Powell’s Books, the selection of Portland’s favorite food trucks, and at the post-security outlet of House Spirits Distillery, where the makers of Aviation American gin and a variety of other regionally-themed, small-batch spirits offer samples. PDX also has a pop-up Farm-to-Table stand offering Oregon produce, wine and cheese; a spa; a barber shop; a great art collection; and an extensive schedule of vendor events and live entertainment that extends through the weekend. And, later this summer, Portland’s non-profit Hollywood Theater will open an 800-square foot in-airport mini-movie theater that will run short films telling Oregon stories. While spending time inside PDX airport is a delight, you’ll eventually want to head outside and explore. The MAX light rail line makes the trip to downtown in 38 minutes for $2.50, but renting a car is almost as easy and allows visitors the freedom to explore everything the Portland area has to offer. On-airport rental car companies are on the ground floor of parking garage P1, across from baggage claim, and the National Car Rental location here has an Emerald Aisle. That means Emerald Club members can bypass the counter, choose their own car and be immediately on their way to the Columbia Gorge National Scenic Area just 20 miles away, Mount Hood, an easy 60 miles away, or the Oregon beaches, which are less than 100 miles from the airport. Or you might not want to drive very far: the Cascade Station shopping center, home to restaurants and shops, including an IKEA, is located just outside the airport grounds.